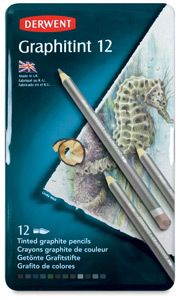 Derwent Graphitint Pencils combine the character of a watersoluble graphite pencil with a hint of color. These exciting new drawing pencils are soft and smooth and can be blended to produce an endless array of soft hues. The set includes the following colors: Port, Aubergine, Dark Indigo, Slate Green, Ivy, Chestnut, Cool Brown, Cocoa, Storm, Mountain Gray, Cloud Gray, and Cool Gray.